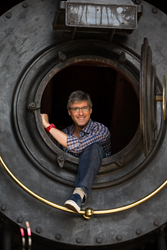 Hosted by CBS News correspondent Mo Rocca and airing each weekend on The CBS Network, the Emmy® winning weekly half-hour program highlights stories related to the process of innovation and showcases the many experiences that are accessible at The Henry Ford Museum. For more information on The Henry Ford’s Innovation Nation, visit http://www.thehenryford.org/innovationnation. Litton Entertainment is the preeminent independent producer and distributor in the U.S. television industry creating and distributing quality programming for over twenty years. Litton’s Weekend Adventure, produced by Litton Studios, and was the first program block of its kind and airs Saturdays on ABC stations nationwide. Litton’s Weekend Adventure features original E/I series including Jack Hanna’s Wild Countdown, Emmy® winning Ocean Mysteries with Jeff Corwin, Emmy® winning Rock the Park, Emmy® winning Born to Explore with Richard Wiese, Emmy® nominated Sea Rescue and Emmy® nominated The Wildlife Docs. Litton Entertainment provides CBS Network with six original programs for Saturday mornings called CBS Dream Team: It’s Epic!, including Emmy® winning Lucky Dog, Emmy® winning The Henry Ford’s Innovation Nation with Mo Rocca, The Inspectors, Chicken Soup for the Soul’s Hidden Heroes, and Emmy® nominated Game Changers with Kevin Frazier. Litton also provides The CW Network with One Magnificent Morning, a five hour destination featuring E/I programming in its second season and beginning October 1st, 2016 Litton will provide NBC stations six original E/I series under the iconic brand, The More You Know. Litton’s syndication and news division distributes a diverse slate of programs including the new E/I block Go Time! launching in Fall 2016 and Consumer Reports TV and The Consumer Alert News Network. For more information about Litton Entertainment, visit http://www.litton.tv.